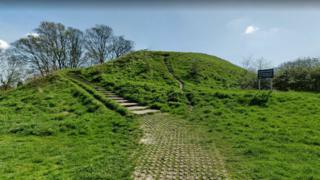 Campaigners are seeking assurances that an ancient hill overlooking Cambridge will not be cut off to the public. Castle Mound, where the city's castle sat, is in the grounds of Cambridgeshire County Council's Shire Hall offices. However, the council is due to move its headquarters to Alconbury, prompting fears the mound will fall into the hands of a private landowner. Councillor Josh Schumann said public access would be maintained under law. Cambridge Castle was built in the 11th Century. All that remains of it is the earthen Castle Mound, which offers one of the only public viewpoints across the city, and it is owned by the council. A 2,000-signature petition raised by the Friends of Castle Mound campaign group has called for the mound - and surrounding open space - to be registered as a "town green" which the group said would protect its public status. Richard Swift, from the group, said: "This has been the civic centre of Cambridge for centuries, from the Iron Age and Roman times - right up until Shire Hall was built in 1934. "It has hugely symbolic, emotional and spiritual importance." A council spokesman said they wanted to "make the most of our assets". County councillor Josh Schumann said a plan to lease the land after they left would generate more than £40m for local services over the next 30 years. He said public access to the mound would still be allowed under the Ancient Schedules and Monuments Act 1979. "Part of the scoring criteria, when we looked at tender, gives significant weight to making sure public access is not only maintained, but improved," he said. But Lib Dem ward councillor Nichola Harrison said "good intentions are not guaranteed forever". "The assurances are good and fine and dandy, but they essentially rely on the goodwill of the council and prospective purchasers," she said. Should student flats be owned by the council?